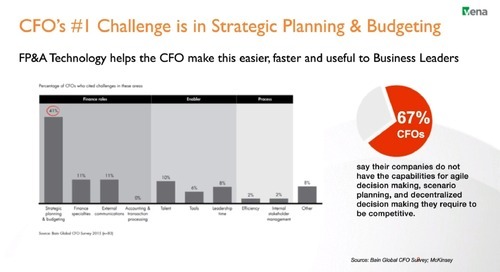 The CFO Playbook » Improve your Budgeting Process » How Can Excel Build a Viable FP&A Future? Of all the people who would try and convince the world that they don’t need Microsoft Excel anymore, Kayne West has got to be one of the most surprising haters. “Burn that excel spreadsheet,” West tweeted. Given that his words were followed by a flame emoji and one of a face laughing so hard it’s crying, maybe it was a joke. Maybe it wasn’t. As with many things West has said, no one really knows for sure. The only thing that’s certain was the fierce “clap back” from the financial community -- just another reminder of how deeply Excel spreadsheets have been wedded to businesses around the world. 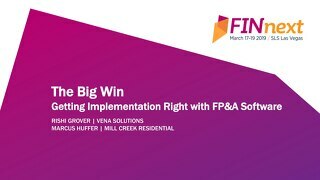 A more professional version of this debate is discussed in Making Excel Work for FP&A, produced by the Association of Financial Professionals and underwritten by Vena Solutions. Even if you get buy-in to stick with Excel, the question is whether you keep using it as-is, or treat it as a platform and build on it with additional tactics and tools. It’s not as though Microsoft has been letting Excel whither into irrelevance. In fact, the report goes into a lot of detail about the ways the most recent versions of Excel can be used to model and visualize data, or to foster collaboration across teams. 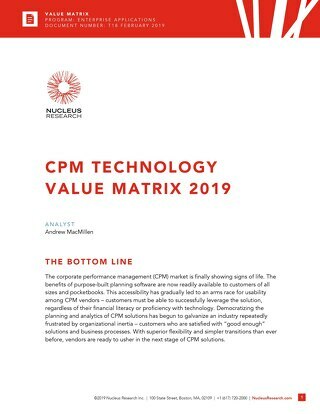 They include Power Pivot, which enables people to filter data and look at millions of rows for analysis, and Insights In Excel, which brings machine learning to look at trends and “outliers” within a particular data set. The launch a few years ago of Office 365, meanwhile, means Excel and complementary Microsoft applications have fully entered the cloud era, giving finance and other users access to their spreadsheets whenever and wherever they need to, on devices from desktop computers to mobile phones. This is a giant leap forward from traditional on-premise versions of the same software. 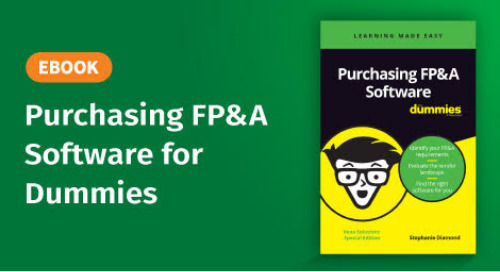 As I said in the report, for more ad hoc processes, Excel by itself still offers most of what FP&A teams need—as long as what you’re doing isn’t frequently repeated and doesn’t involve large data sets or collaboration among users across your organization. 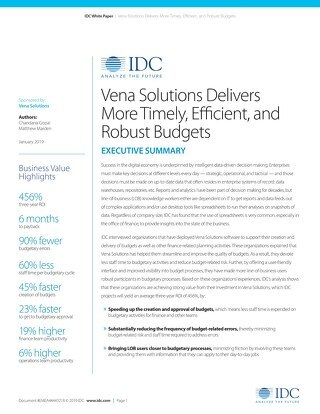 Depending on the number of data sources you’re integrating, the amount of effort you spend putting data into Excel, and how you ensure the accuracy of the data, it may be time to move to a more dedicated system. When that time comes, you have to involve the end user in the process, because if it’s not adopted, you’re wasting your time or money. They’ll want (and need) something simple and intuitive enough that they don’t simply revert back to exporting data into Excel. There’s no point in moving to a new system if “shadow spreadsheets” begin to proliferate, for instance. Fortunately there are already plenty of organizations demonstrating what the right approach can look like. Matt Blickley offers a textbook example of how to take this journey in a way that leads to real long-term value for the business. The good thing about using a hybrid solution is, you have a very powerful database, and powerful querying report-writing tools on the back end. So if you’re looking to do analysis on a certain part of data, you can write reports or queries that only include the data that you need. You have a database on top of Excel that’s fast, secure and reliable, and you can get whatever data out of it that you want. 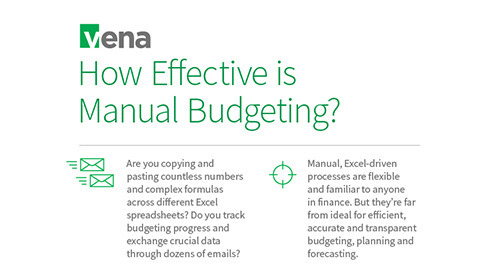 You get all the benefits of Excel, without having to deal with the massive amounts of data. There’s a growing consensus around this kind of thinking. In fact, an article appeared in Accounting Today just as this report went to press which echoed Blickley’s sentiments. 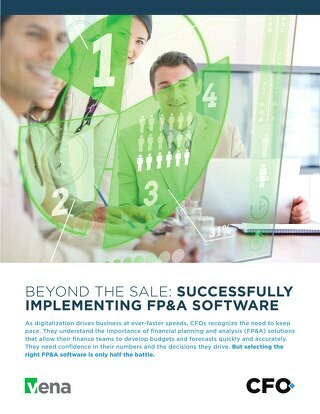 The full AFP report is well worth downloading and reading in its entirety, but one of the underlying themes is how smart organizations have found ways to continue using Excel while making the best use of their data, aligning it with their business goals and allowing employees to work the way they think. Double Down on Excel. If spreadsheets are getting the job done, lean into the technology in a way that positions you as the go-to person for training, coaching and troubleshooting. 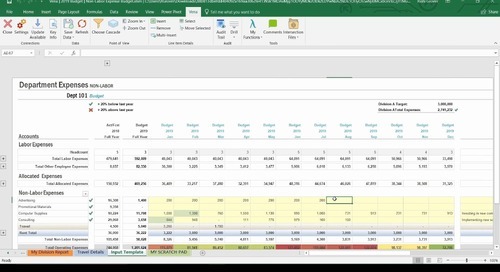 One finance manager interviewed in the report not only continues to use Excel as a way of wrestling with complex data challenges, but behaves almost like an internal consultant by monitoring and evaluating the new features Microsoft introduces into the application. This includes slicers to filter through pivot table data, and sparklines – the tiny charts that allow you to visually represent data. His commitment to understanding the technology ensures new business needs are met without a lot of disruption. Say ‘Hi’ To Power BI. There are some organizations who take what the report’s authors describe as an “Excel Extended” approach where they use some of Microsoft’s newer tools (such as Office 365) to develop and share dashboards easily through the cloud. 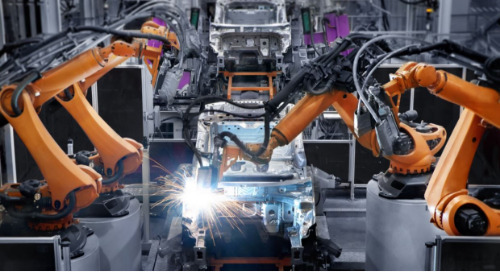 One FP&A manager said that Power BI has saved time and eased the creation of insightful models, though he admits there was some significant up-front work in getting the models and reports to jive with the tool. Think Like A Coder. There’s another finance manager in the report who actually went to the trouble of learning how to code in Python to build his own Excel-based system. 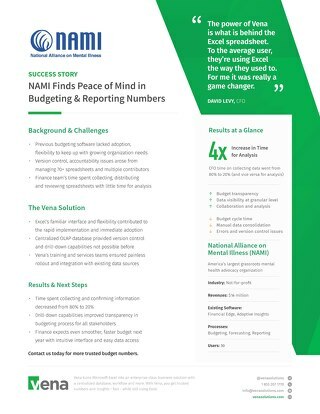 That’s probably taking things farther than most CFOs and their teams are willing to go, but the point is to keep an open mind about the many ways you can make Excel work for your needs. 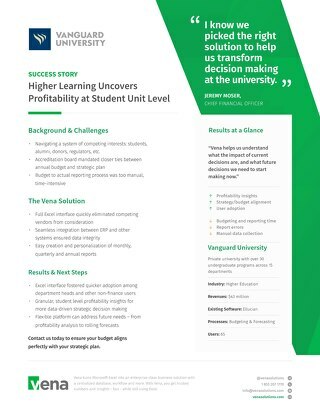 The report goes on to uncover many of Excel’s lesser known features and hidden gems that even experienced power users haven’t noticed before. If you want Excel to keep working for you, now’s the time to take notice. There’s a common misconception that Excel loyalists are only found in the office of finance. 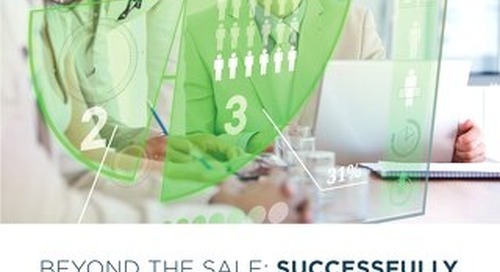 From sales and marketing to development and distribution, the reality is much different. 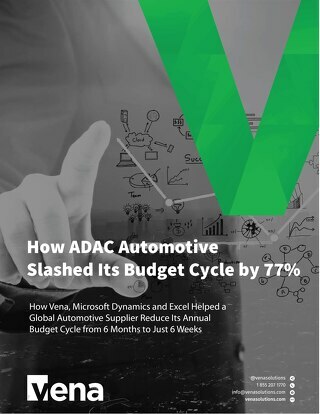 In its 2018 Marketing Measurement & Attribution Survey Report, for example, DemandGen shows that 52% of marketers report on their results and KPIs in Excel. 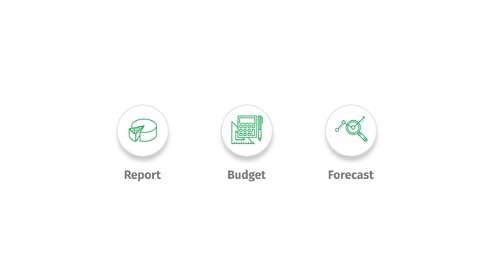 As a matter of fact, spreadsheet software actually came out well ahead of more sophisticated tools like customer relationship management (CRM) software, marketing automation and attribution platforms – even before e-mail. 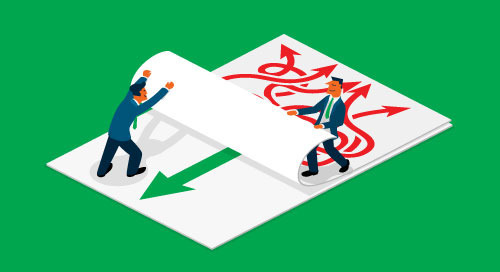 When it comes to new technology, companies often talk about the challenges of “change management,” but that’s most often the result of taking employees away from what’s tried and true – requiring them to learn entirely new systems, languages and even behavior. That’s neither the only path, nor the right one. 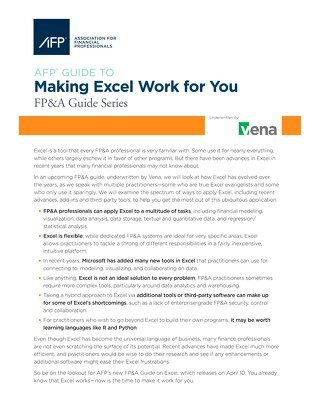 Download Making Excel Work for FP&A to discover the path that’s right for you. 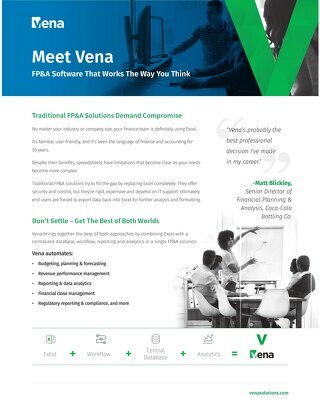 As Chief Solutions Architect, Rishi is responsible for the day-to-day operations and continued success of client implementations at Vena. 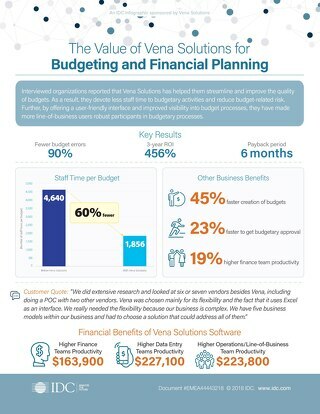 Rishi has helped many Fortune 500 companies re-engineer and optimize financial processes. 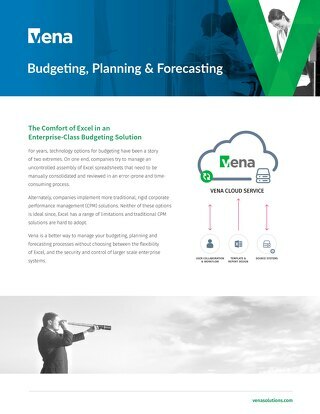 His expertise in financial planning and regulatory reporting helped him to the position of Director of Enterprise Solutions at Clarity Systems before he co-founded Vena Solutions with Don Mal and George Papayiannis. Rishi holds a Bachelor of Applied Sciences from the University of Toronto, specializing in Computer Engineering and Communication Systems. 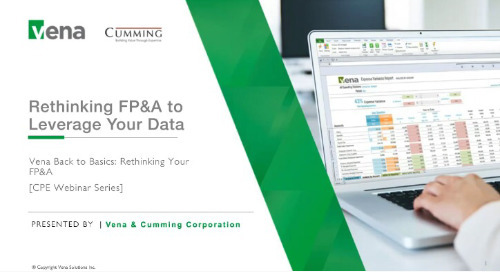 Preview observations and findings from AFP's expert research on getting the most from Excel for financial planning and analysis (FP&A).